The school, a Christian foundation, is committed to the provision of an excellent education for all. We have a ‘motto’ to sum up our aims: Standards, Responsibility and Opportunity …… for All; this helps to make our vision for students clear and explicit. We promote Christian values through the experience we offer to all students. 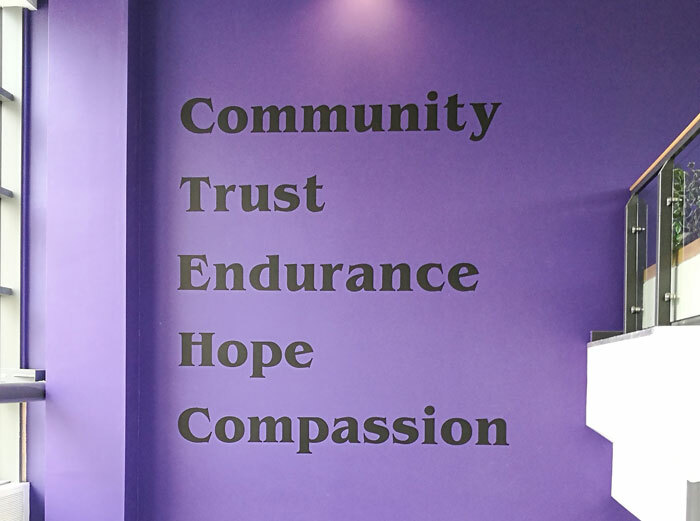 Following discussion with staff, students and governors we focus most closely on the values of community, trust, hope, endurance and compassion. These are reinforced through assemblies and Thought for the Day. We value the uniqueness of all God’s children and make sure that we are inclusive (…for all) in our approach to all aspects of our work. We aim to provide the highest standard of education, in its broadest sense, for all of our students and we expect the highest standard of effort and conduct from students, stressing the value of hope in the belief that all students can achieve well with dedication and a positive approach. We also stress the value of endurance, dealing with setbacks, in order to achieve ambitions. We encourage all students to be responsible, taking responsibility for their behaviour towards others, treating others as they would wish to be treated, respecting those who are different to themselves, serving others both within and beyond the school community. We seek to provide rich opportunities and encourage students to grasp these, developing their curiosity, creativity, spirituality and understanding and appreciation of the world around them. We aim to make a difference to young people’s lives, to develop an awareness and respect for spiritual and moral values, so that they, in turn, can enrich the lives of others. 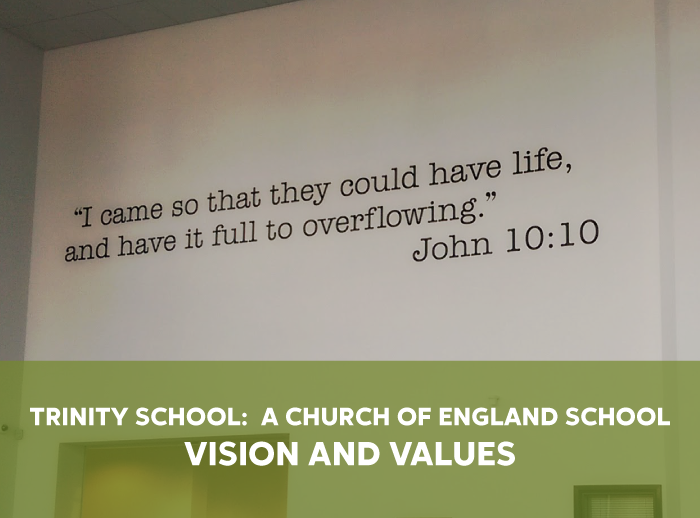 The biblical quotation (John 10:10) on prominent display in our Jubilee Hall makes clear our mission: to ensure that our students leave us with the values, knowledge and skills which will enable them to lead a full and fulfilling life. The main purpose of collective worship at Trinity School is to support the personal development of each individual student in our school community. 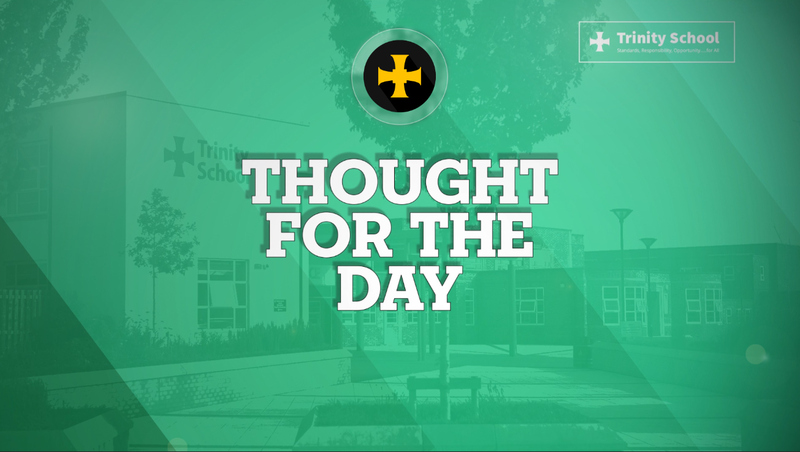 Collective worship is delivered through our House Assemblies and through our Thought for the Day programme. There are two House assemblies each week, other than during exam season where the halls are in use, led either by the head of house, a member of the Senior Leadership Team, the School Chaplain, or a member of the local clergy. We have a member of the local clergy linked to each of our four houses and they lead assemblies approximately every three weeks. On the three days a week where students are not in House assemblies, tutors deliver our Thought for the Day programme. The materials for these are prepared by the School Chaplain, the Reverend Caroline Kennedy. Each week there is a ‘setting the scene’ clip based on a particular theme, with big questions to consider and using contemporary, relevant materials to engage students in debate and discussion. Themes are often centred on the core Christian values which are a focus for us in school: community, hope, endurance, trust and compassion. This half term the themes are connected to our school prayer: adventure, treasure and spirit.